September 13, 2018 /Photography News/ Born 58 years ago, on 13 September 1960 (d. 27 July 1994), Kevin Carter was an award-winning South African photojournalist and member of the Bang-Bang Club. He was the recipient of a Pulitzer Prize for his photograph depicting the 1993 famine in Sudan. Following the winning of the Pulitzer Prize he committed suicide at the age of 33. 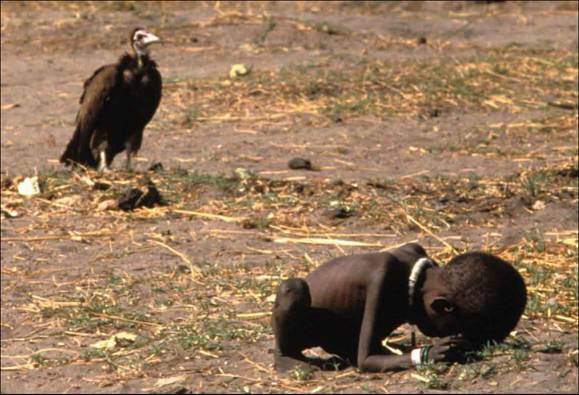 In March 1993, while on a trip to Sudan, Carter was preparing to photograph a starving toddler trying to reach a feeding center when a hooded vulture landed nearby. Carter reported taking the picture, because it was his "job title", and leaving. Sold to the New York Times, the photograph first appeared on 26 March 1993 and was carried in many other newspapers around the world. Hundreds of people contacted the Times to ask the fate of the girl. The paper reported that it was unknown whether she had managed to reach the feeding center. On May 23, 14 months after capturing that memorable scene, Carter walked up to the platform in the classical rotunda of Columbia University's Low Memorial Library and received the Pulitzer Prize for feature photography. With the success of the image came a lot of controversy, and questions were raised about the ethics of taking such a photograph. An article printed in 1994 in the St Petersberg Times commented on the morality of Carters actions, ‘the man adjusting his lens to take just the right frame of her suffering might just as well be a predator, another vulture on the scene,’ (Stamets cited in Ricchiardi, 1999). The National Press Photographers Association (NPPA) have a ‘Code of Ethics’ which sets out certain ethical responsibilities when carrying out journalistic work, one reads as thus, ‘while photographing subjects do not intentionally contribute to, alter, or seek to alter or influence events’ (NPPA, 2010). Considering this, one can say Carter was objective and documented what he saw, capturing the severity of the situation in Sudan. But does this alleviate him from the responsibilities of being a good human being? "I am depressed ... without phone ... money for rent ... money for child support ... money for debts ... money!!! ... I am haunted by the vivid memories of killings and corpses and anger and pain ... of starving or wounded children, of trigger-happy madmen, often police, of killer executioners ... I have gone to join Ken if I am that lucky." Carter's story is depicted in the 2010 feature film, The Bang-Bang-Club in which he was played by Taylor Kitsch. I happen to have this whole video of the above scene and this video has changed my life forever learning that gratitude is a blessing of ones soul. I read that there was a plane nearby that had landed to distribute food and that this child was likely left there briefly during that process and that once the photo was taken that Carter chased the bird away and the child wasn't in danger from the bird. Please note, it should read, "... member of the *so-called* Bang-Bang Club." This was never an official group or title in any way. What a sad ending to a photographer who created such thought provoking work. A tragic end for such a talent. It is said that 85% of artists are emotionally disturbed. of the greatest talents our planet has seen, have not survived for long with us. endured, long past the time that I have cared to. Pray that you will never know the Hell where youth and laughter go.World should thank this man for showing this disgrace that spattered all of us with innocent blood.Man how I hate war and needless slaughter. Touching clicks......Express the whole story!!!! We Are Provide Best & Awesome Groundhogs day Quotes ,Groundhog Day Quotes ,Groundhog Day 2016 ,Groundhog day Pictures ,Groundhog Day History ,Groundhog Day crafts Etc . We Are Provide Best & Awesome Lent Quotes ,Lent images ,Lent Poems ,Lent Wishes ,Lent Sayings ,Lent Greetings ,Lent 2016 Etc . Holi festival of colours has great significance in the life of Hindus.so here we provide some images,saying,wallpapers,wishes and quotes. Astrology and vashikaran is science of helping people in whatever they desire and fulfill all dreams, now astrology ha progressed a lot that with the help of vashikaran , black magic and many more techniques all major problems can be easily solved out and can fulfill all the dreams. Pandit rk shastri is vashikaran, black magic expert and specialist can help you with all your major problems of life to make your life more successful, happy and prosper. Now a day’s pandit rk shastri is helping people to get the desired love back. asy Happy Father’s Day Thoughts Slogans Poems Essay Topics Fathers Day Printable Pictures Hello guys I am back with the most recent update on yours devoted website of father day 2016. There is nothing more than a dad who always stand by you in any problem of you, Yeah its true that sometimes he gets angry on us but it doesn’t mean he doesn’t love you So for all those who are going to wishes their dad a very happy fathers day we have the latest stuff like heart touching fathers day quotes poems thoughts and lines which you can also post on any social media site which will show how much do you love your dad and its not only the way which shows it Fathers Day Fb Status but somewhere it will surely impress your dad and will hep you to express your feelings. 391 comments so far. What do you think?